Kuldeep Meena completed B.Tech from IIT Delhi. He is a Physics Guru with 4 years of vast teaching experience. He wishes to bring together the traditional and unconventional ways of teaching and learning. 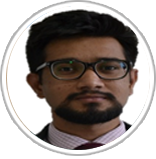 He believes in leveraging his vast experience and knowledge by benefiting student community at large. He says that in the new scenario of JEE, students must aim at attaining a balance between their board preparation and JEE preparation. To attain this balance one need to concentrate on their subjects and prepare their basics so that their concepts are strong. My aim is always to make their basics strong so that they can crack any competitive exam with ease. He is best know for teaching modern Physics and Electricity and Magnetism. My Physics Tutor is Excellent. He explains all the concepts with adequate examples. I am impressed by his way of teaching. The Physics classes have been running smoothly and all my doubts have been clearly explained to Me. !